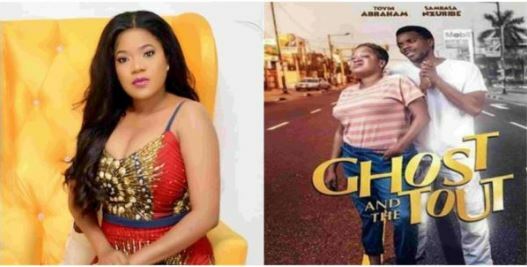 Popular outspoken actress, Toyin Abraham who recently got engaged has had her new movie, ‘The Ghost and the Tout’, which debuted in the cinemas on May 11 make over N30 million. The movie has made over 30 million naira in revenue since the day of its opening, which is an incredible feat considering stiff competition from Avengers and Deadpool. The movie which is a joint venture of Toyin Abraham and Samuel Olatunji has witnessed multiple sold-out viewings in Lagos, Benin, Ibadan, Enugu, Akure and several other cinemas across the country. Ex-big brother Naija housemates Alex and Tobi also joined in promoting the movie. The movie tells the story of Isila (Toyin Abraham), a young woman from the ghetto who encounters a ghost in need of her help to communicate with the people he left behind. Only Isila can see the ghost. At the ghost’s request, she becomes tangled in solving a murder mystery and her life takes an interesting turn. The story was told in the most hilarious way.